Yesterday/Today the cable for the subsea electricity connection between the Netherlands and Denmark was brought ashore in Eemshaven in the Netherlands. From the ship Ulisse on the Wadden Sea, the cable was pulled ashore via a duct installed in the sea wall for that purpose. The cable will then be connected to the converter station that was built 1 kilometre away in Eemshaven. 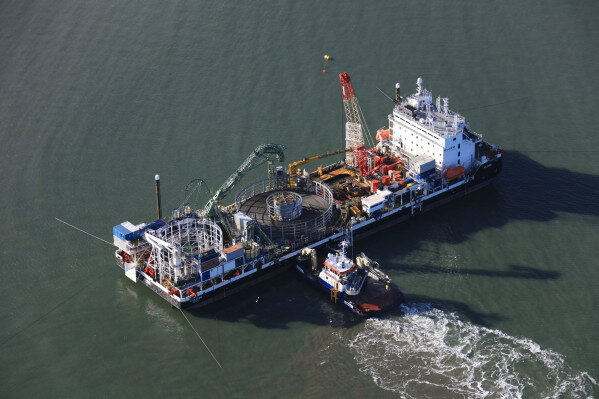 This so-called COBRAcable is a joint project implemented by Dutch TSO TenneT and its Danish counterpart Energinet. Cable manufacturer Prysmian is responsible for manufacturing and installing this 325-kilometre-long electricity cable. The cable, which has an aluminium conductor with a cross-section of 2500 mm², has a total transmission capacity of 700 MW at a voltage level of 320 kV DC. The diameter of a single cable is 147.3 mm; its weight in water is 30 kg/m. The cable connection consists of two bundled high-voltage direct current (HVDC) cables that are laid from a special installation vessel at least 1.5 metres into the bottom of the North Sea. In mid-2019, the final cable section, measuring approx. 20 kilometres, will be installed in the Dutch/German Wadden Sea area. After a trial period, the complete cable connection will be in operation in the third quarter of 2019. COBRAcable links Eemshaven (the Netherlands), through the German sector of the North Sea, to Endrup (Denmark). The connection has been constructed as a High-Voltage Direct Current (HVDC) cable, since the use of DC technology minimizes transmission losses over long distances and therefore virtually eliminates any loss of electricity. Two onshore converter stations – one in the Netherlands and one in Denmark – are needed to connect the cable to the Dutch and Danish HV grids. The converter stations will convert the electricity from direct current to alternating current and vice versa. The transformer will then ensure that the voltage of the converter (320 kV) is adjusted to the voltage of the Dutch grid (380 kV), so that the 700 megawatts that can be transmitted over the COBRA cable can be converted without any problems and connected to the high-voltage grids in Denmark (400 kV) and the Netherlands (380 kV). The COBRAcable will play a key role in the implementation of the Dutch and European sustainability objectives. The COBRAcable will ensures a better exchange of sustainably generated energy and a reduction of CO2 emissions, and will promote the further integration of the European energy market and therefore have a dampening effect on electricity prices in the Netherlands and Europe. In addition, the COBRAcable will contribute to network stability in the Netherlands and Denmark, and the cable will more than pay for itself through the auctioning of transport capacity.